PM Netanyahu congratulates US on ICC decision not pursue Afghanistan case, vows to launch another craft to the moon. Prime Minister Binyamin Netanyahu congratulated US President Donald Trump on the decision of the International Court of Justice in The Hague not to investigate American soldiers for alleged war crimes in Afghanistan. "At the end of the week there was a very significant development: The International Court of Justice in The Hague rejected the demand to investigate the soldiers of the United States. This would have put an end to the purpose for which the International Court of Justice was established," Netanyahu said. "It was established to deal with the horrors of countries that do not have a proper legal system, and that they are harassing the Americans and / or Israel and putting them to trial is absurd and contrary to what the purpose of establishing the International Court of Justice was. I think that this has extraordinary implications for the conduct of the world. I congratulate the United States and President Trump. We very much appreciate the support in this area as well," the prime minister added. Turning to the attempted landing of an Israeli spacecraft on the moon last week, Netanyahu said: "The Beresheet spacecraft put Israel in the history books." "We have become one of the seven countries that have orbited the moon. 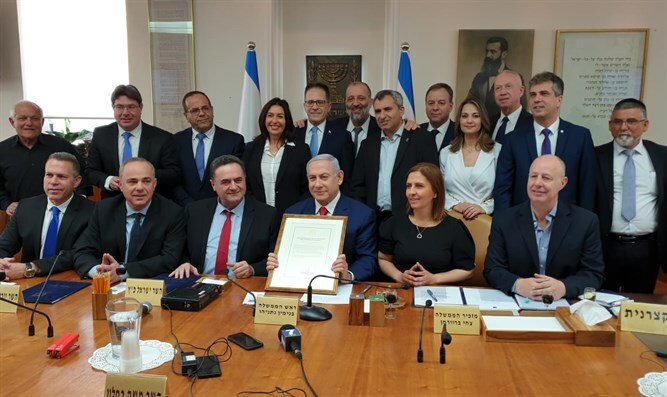 This is a tremendous achievement for SpaceIL, and we intend to launch Beresheet 2, which the state will also participate in building, proving our capabilities - this is the difference between winners and losers. Netanyahu held a toast with the members of the cabinet. "I want to congratulate the government on four years of achievements and achievements, which is reflected in the public's trust, and we will continue to do so in the next government."